Home | Fall Fest is Friday, October 20th! Fall Fest is Friday, October 20th! Fall Fest 2017 will feature carnival-style games, food, music, costume contest, the premier Spooktacular orchestra and chorus concert, Haunted Nature Trail, and so much more! Note: the Willis Park gate will be open until 8:00 PM for walkers and bikers. Avoid the line! Pre-order concessions and activity tickets here before October 13th. Food and activity tickets will also be available the day of the event. RSVP & Get TicketsPre-ordered food and activity tickets will be delivered to your child’s classroom to be sent home in advance of the event. Don’t miss the first annual TMS Spooktacular in the basketball court at 5:30. Enjoy spooky tunes from Middle School chorus and orchestra students. Blankets and chairs welcome! Costume Contest Starts at 6! 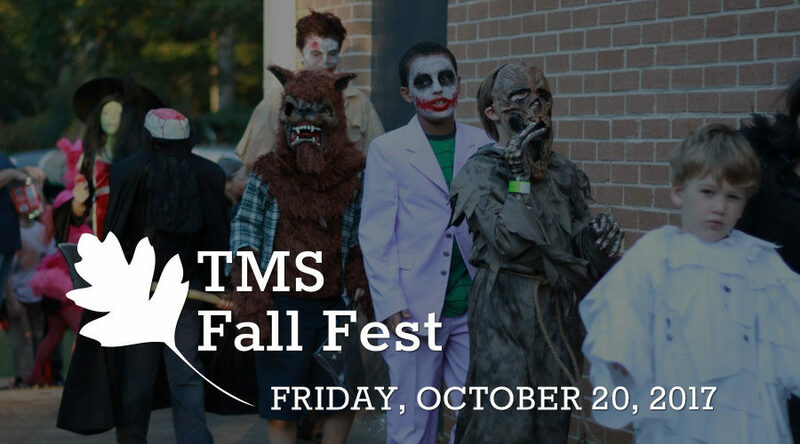 TMS Board Chairman Andy Huff and Principal Kelbaugh will award prizes in 5 categories: Scariest / Spookiest, Most Original, Cutest, Best Superhero and Most Realistic. Sign up to participate from 5-6, judging begins at 6:00 PM. Middle School has been hard at work planning and producing a super spooky Haunted Nature Trail! Stop by the ticket booth for your $1 ticket, or bring a dollar to the entrance of the trail. Haunted Trail opens at 6:30. Looking for ways to get involved with Fall Fest? Many thanks to our current sponsors! Proceeds from Fall Fest benefit TMS PTO Teacher Mini Grants. Proceeds from the Haunted Trail benefit the Middle School Fund. Don’t Miss Into the Woods, Jr. May 10 & 11!